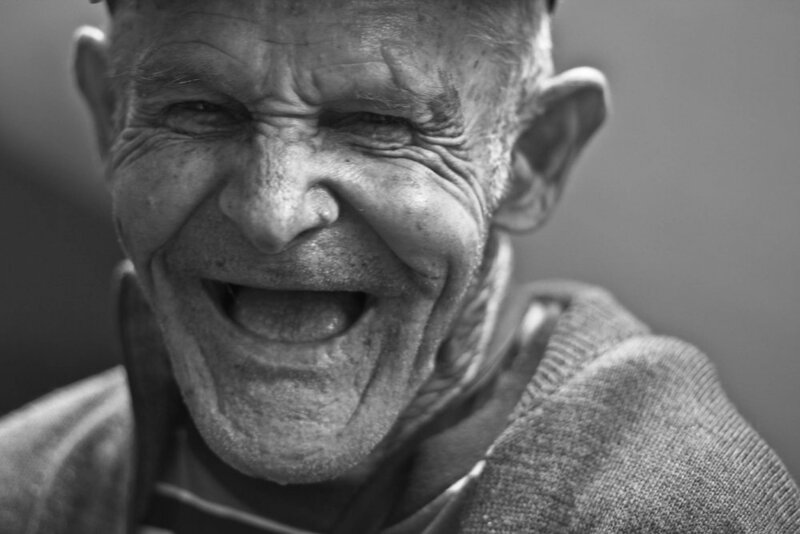 A Life Well-Lived: What Makes Us Truly Happy? What do I really need to do to be happy? How can we live more joyfully? Discussions of happiness are as old as humankind. Hunter-gather societies looked to the sky to finding meaning and purpose in something greater than themselves. In the West, thinkers like Aristotle considered how virtue played a role in eudaimonia, or "flourishing." While Socrates and Plato considered how humankind cultivated a place in the world through virtue, and thus happiness through learning & following a set of ethical principles, Aristotle added the idea of practicing virtue using social & emotional skills ("Aristotle's Ethics," Stanford Encyclopedia of Philosophy, updated 2018). In the East, Confucius considered how -any person, regardless of social standing, could pursue self-cultivation and moral virtue as a way to life happiness. It is important to note that discussions of pursuit of happiness often go hand in hand with thinking about virtue. Confucius talked about how any person could achieve the level of a "Junzi" (chün-tzu) or a noble or ruler's son, by seeking personal cultivation and the flourishing of humankind. On the other hand, Confucius compared this to the (xiaoren; or “little person”) who was egotistically driven, only focusing on personal gain and limited in understanding by their own personal biases. Finally, the Sage (shengren), the rare person who had a profound understanding of human nature (Matt Stefon, Encyclopedia Britannica). Much like Western philosophies, Confucianism focused on Jen, or the idea of helping humankind, and respecting the dignity of all people. Kant wrestled with the very idea of virtue in his writing - and came to the following conclusion: happiness and virtue went hand in hand. As Andreas Follesdal, Reidar Maliks explain in "Kantian Theory and Human Rights," Kant believed that happiness was more the result of doing things with a worthy cause, and as would be the case, for the world; this is what Kant believed produced true happiness. Kant also believed that the more we pursued happiness, the more it alluded us, because we did not know what ultimately would make us happy. Kant essentially believed in doing the right thing out of duty to our fellow human - rather than using people as a means to an end. Many of Kant's ideas laid the foundation to human rights principles. So what Kant refers to in the quote above is a "state of contentment," in agreement with many spiritual practices. Instead of focusing on the selfish pleasure, happiness is more about what we do for others. When I started this website, I wanted to share simple ways for people to find joy. And it seems that wisdom and common sense guide us in the right direction. Yet, it is also reassuring that research seems to give us proof that these methods actually work and matter. Finding happiness, or what some might call "contentment" or "joy," gives a central focus to the way we live on a daily basis. If we begin to live more intentional lives, we see ways we can reconnect with ourselves and others. We may start to see that happiness is more about giving, rather than receiving. But the way we define happiness also matters. As a result of the society's interest in what determines social well-being, new theories of happiness continue to develop and grow. Martin Seligman, 'the father of Positive Psychology' studies, proposed a new theory of 'well-being' to explain what makes people 'flourish' in life. Yet, as Martin Seligman suggests in his book, "Flourish," happiness is not a fleeting emotion characterized by always being in a cheerful mood, but something so much greater-he goes on to say that "well-being is a construct, and happiness is a thing." He explains that the goal of positive psychology in the well-being theory is to increase the amount of flourishing in life. In the prologue, Seligman asserts, "The content itself - happiness, flow, meaning, love, gratitude, accomplishment, growth, better relationships - constitutes human flourishing. Learning that you can have more of these things is life changing. Glimpsing the vision of a flourshing human future is life changing." The aim of his book is to increase well-being through explaining his theory, and thus enable you to flourish. So where can be happiness found? These reflections on what truly makes people happy are important. They give us direction into how to live our lives. 5. Extending random acts of kindness to others. Most researchers in the field of psychology suggest evidence that our daily behavior greatly influences our level of happiness in life. These seemingly small changes to our daily routines, over time, seem to have a profound impact on our level of joy in life. Research suggests that practicing gratitude helps us live a more joyful life. In this interview, Peterson went on to explain that in his twenties he was painfully shy, but he decided to force himself out of his shell-and this change made him happier, as he increased his connections with people. Peterson also believed that creativity was correlated with happiness. Other things like smiling, he said, were a "marker" of how people lived their life. According to Peterson, positive psychology focuses on identifying your strengths, passions, and cultural institutions that aide in well-being. He also said that we grow as a result of life suffering and struggles. Peterson went on to say that "happiness is a product of our pursuits . . that make life worth living." In conclusion he explained, positive psychology can be summed up as follows: "Other people matter." He suggested we can find life meaning in purpose in things outside ourselves, like spirituality, religion, family, friends, or ideas greater than ourselves. What about Money & Happiness? — - Dr.R Murali Krishna, MD, DLFAPA, Excerpted from The Pursuit of Happinesss: Characteristics of Happy People, World of Psychology. In fact, a Princeton study by Noble-prize winning, psychologist Daniel Kahneman and economist Angus Deaton, suggests that beyond a salary of $70,000, additional money does not show additional gains in happiness. The study brings to light some issues related to how people view money. One such person was CEO Dan Price who decided to raise all his employees incomes to $70,000, and cut his pay from $1 million a year to $70,000 (Cohen, One Company's New Minimum Wage: 70,000 per year, NY Times, 2015). In the NYT article, Cohen describes himself as a capitalist and business leader who saw the problems income inequality created for his employees and realized he had an opportunity to effect change head-on. It is evident that Price was driven by something greater than himself when making this change. Picture by FireflySixtySeven. from wikipedia commons. So when we talk about happiness and life fulfillment, the pursuit of money doesn't fit the bill of true joy. While money is necessary to meet our physical needs, which we can not underestimate, it does not give our life meaning. Money can't buy watching a sunset, or the feeling you get after a run. Money can't buy the sense of accomplishment for a job well-done, or the feeling of joy after helping someone out. As the Beattles said to the world, money can't buy love. Like many things, money is a resource to use wisely that meets our hierarchy of needs, but it is not the source of happiness. 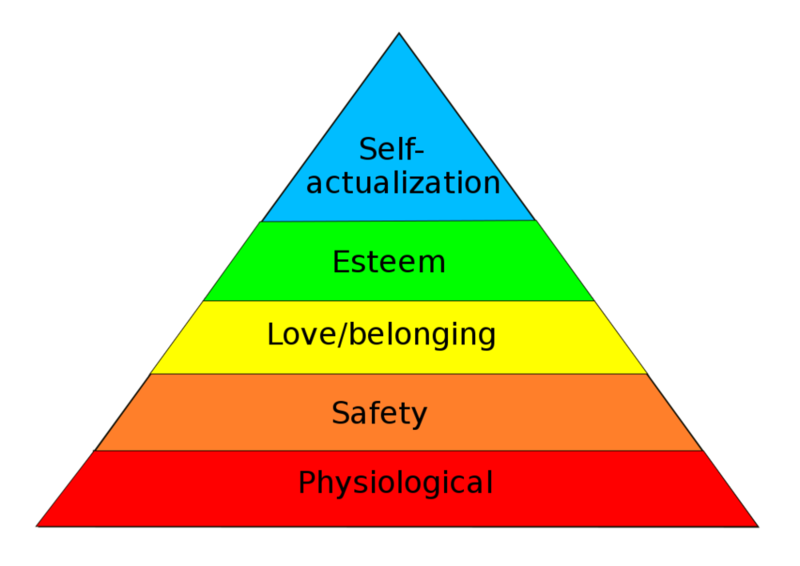 The theory of 'hierarchy of needs', by Maslow, suggests that once the basic physiological needs and safety are met, people are motivated to furfill the needs of love/belonging, esteem, and self-actualization. If you look at the top three levels of the pyramid, it is easy to see that while money may make this pursuit somewhat easier, it will not solve the pursuit or really address the fundamental core of these issues related to happiness. Simply stated, once our basic needs our met, happiness can not be found in money. One can not talk about happiness without considering the longest study of happiness - the Harvard Study of Adult Development currently directed by Dr. Robert Waldinger. The study began in 1938 and considers the lives of 724 men (JFK being one of them). It implies that the quality & depth of close relationships were the greatest predictor not only of emotional health, but physical health as well. In this study, loneliness seemed to negatively affect health. Dr. Waldinger, who is also a Zen priest, says that ". . .giving people are full, undivided attention is probably the most valuable thing we have to offer. . . over time it can really make a difference." (From an interview on CBS this morning). Connections to a greater purpose and to others, make a lasting impact on day to day life - and ultimately lead to a life of joy. By changing our perceptions and the way we interact with the world, small things cascade into lasting life changes. We appreciate the little moments by stopping to fully enjoy them. We seek the opportunity to pursue things that matter to our heart and soul and affect change in the world. And maybe most important - we realize that we are human - as Brene Brown suggests in the quote above, not because we exist as an island, but because of our connection to each other. Living this idea intentionally has been perhaps one of my greatest teachings in my own life. I have explored living with more and living with less, in my blog thejourneytominimalism.com, and in my own social experiment. I have found that the greatest contentment in life does not come from things, but from living a good life, from doing the right thing, and from connecting to people and helping others. Perhaps the greatest thing we can do in life is not seek happiness for ourselves, but to make the world better. 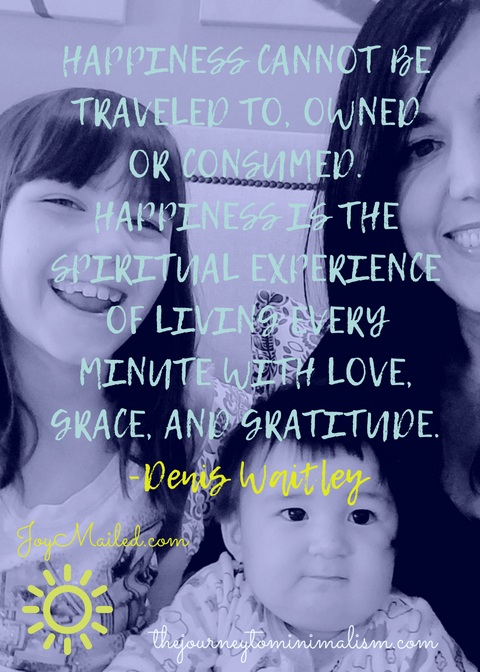 As I continue to learn, I will to write on Joymailed about finding happiness and joy. Please share your own ideas and impressions with me below. Thank you for connecting and sharing your own story. "Aristotle's Ethics," Stanford Encyclopedia of Philosophy, updated 2018. Andreas Follesdal, Reidar Maliks "Kantian Theory and Human Rights"
Shawn Achor, Ted Talk, "The Happiness Advantage: Linking Positive Brains to Performance"
University of Michigan News Service, Christopher Peterson, Interview, published October 18, 2011 (Part 1). Martin E. P. Seligman, "Flourish: A Visionary New Understanding of Happiness and Well-being"
Daniel Kahneman and economist Angus Deaton, "High income improves evaluation of life but not emotional well-being"
Dr. R. Murali Krishna, "The Pursuit of Happiness: Characteristics of Happy People," Pysch Central. For more on Dr. Murali Krishna see www.drkrishna.com.